Want to be notified of new releases in prompt-toolkit/pymux? Issues, questions, wishes, comments, feedback, remarks? Please create a GitHub issue, I appreciate it. Start it by typing pymux. A terminal multiplexer makes it possible to run multiple applications in the same terminal. It does this by emulating a vt100 terminal for each application. There are serveral programs doing this. The most famous are GNU Screen and tmux. 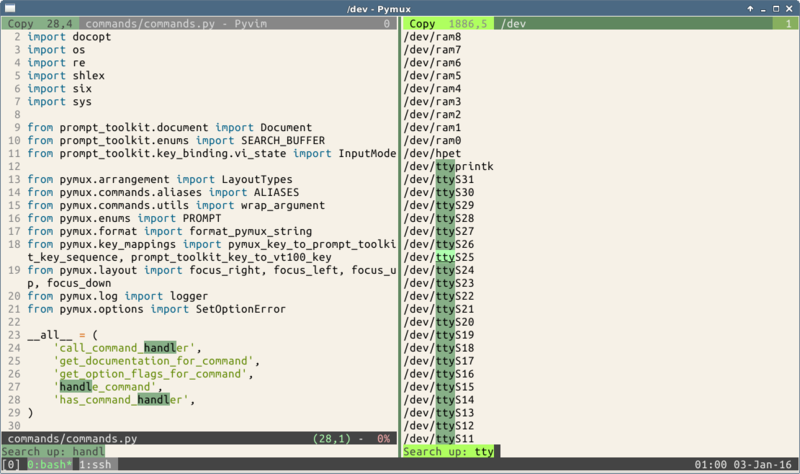 Pymux is written entirely in Python. It doesn't need any C extension. It runs on all Python versions from 2.6 until 3.5. It should work on OS X and Linux. 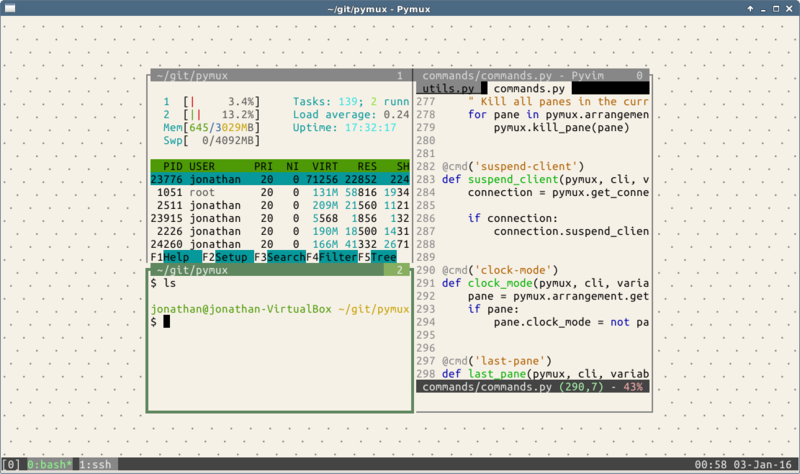 To some extent, pymux is a clone of tmux. This means that all the default shortcuts are the same; the commands are the same or very similar, and even a simple configuration file could be the same. (There are some small incompatibilities.) However, we definitely don't intend to create a fully compatible clone. Right now, only a subset of the command options that tmux provides are supported. The command line has fish-style suggestions. Both Emacs and Vi key bindings for the command line and copy buffer are well developed, thanks to all the effort we have put earlier in prompt_toolkit. Search in the copy buffer is highlighted while searching. Every pane has its own titlebar. When several clients are attached to the same session, each client can watch a different window. When clients are watching different windows, every client uses the full terminal size. Tmux is written in C, which is obviously faster than Python. This is noticeable when applications generate a lot of output. Where tmux is able to give fast real-time output for, for instance find / or yes, pymux will process the output slightly slower, and in this case render the output only a few times per second to the terminal. Usually, this should not be an issue. If it is, Pypy should provide a significant speedup. The big advantage of using Python and prompt_toolkit is that the implementation of new features becomes very easy. Why create a tmux clone? For several reasons. 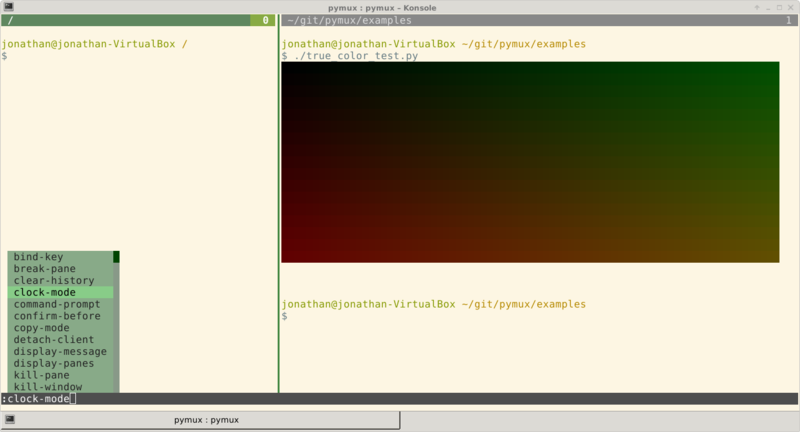 Having a terminal multiplexer in Python makes it easy to experiment and implement new features. While C is a good language, it's not as easy to develop as Python. Just like pyvim (A Vi clone in Python. ), it started as another experiment. A project to challenge the design of prompt_toolkit. At this point, however, pymux should be stable and usable for daily work. The development resulted in many improvements in prompt_toolkit, especially performance improvements, but also some functionality improvements. Further, the development is especially interesting, because it touches so many different areas that are unknown to most Python developers. It also proves that Python is a good tool to create terminal applications. There is no official roadmap, the code is mostly written for the fun and of course, time is limited, but I use pymux professionally and I'm eager to implement new ideas. Support for extensions written in Python. Maybe some cool widgets to traverse the windows and panes. Create a file ~/.pymux.conf, and populate it with commands, like you can enter at the command line. There is an example config in the examples directory. If for some reason pymux crashes, it will attempt to write a stack trace to a file with a name like /tmp/pymux.crash-*. It is possible that the user interface freezes. Please create a GitHub issue with this stack trace. docopt, for parsing the command line arguments. prompt_toolkit, for the UI toolkit. wcwidth: for better unicode support (support of double width characters).